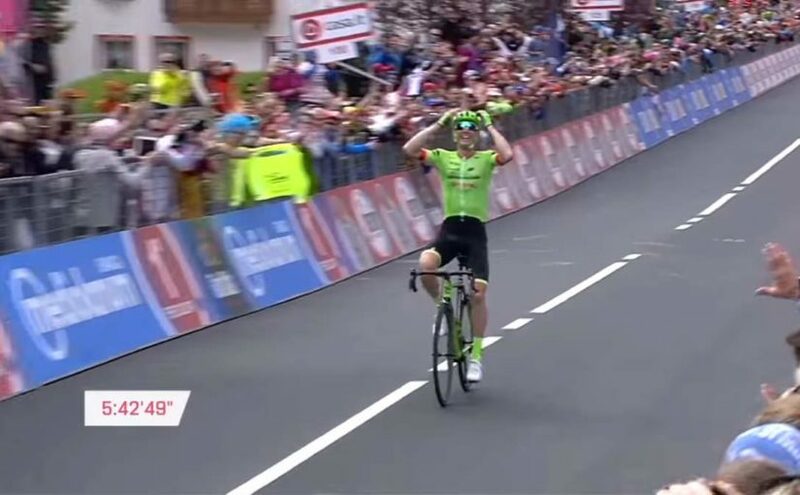 Stage 17 of the Giro d’Italia 2017 was won by Pierre Rolland, the French rider of Cannondale–Drapac. Rolland and his team were really needed this victory: Rolland’s last Grand Tour stage win was back in 2012 (Stage 11 of the Tour de France), and the American Squad didn’t win a single World Tour race for the last two years (actually, Andrew Talansky won Stage 5 of the Amgen Tour of California atop Mt. Baldy on Thursday May 18, 2017 – but before that, the last two years were empty). The moment the race was won interesting: Rolland stopped pedaling and waited for the big chasing group – this was the decisive “move” of the race. Rolland, Pavel Brutt (Gazprom – Rusvelo) and Rolland’s former teammate young Matej Mohorič (UAE Team Emirates) attacked from the kilometer zero. Then almost 40 riders also attacked and started chasing the leading trio. The peloton, which include the maglia rosa didn’t chase this big group and the gap gradually increased. It was clear that the big favorites were racing defensively today. And it was also clear that the chasing group was big, strong and organized enough to catch the leading trio. 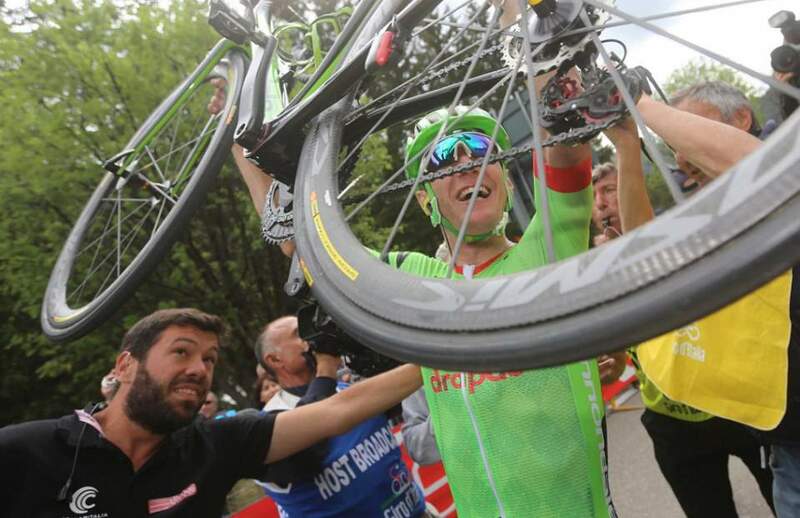 Pierre Rolland celebrated his victory by holding his bike over his head, in his special style. Roland (and his team) well read the moment, and Rolland stopped working with the other two riders. Instead, he stopped pedaling and waited for the chasing group. He clearly wanted to save energy for the rest of the stage. Eventually, first Brutt, then Mohorič got caught by the group. As the finish line getting closer, riders started attacking but all attacks were neutralized. With 7.6 km to go, Rolland took off. It was a strong attack and he was never seen again. He got a much needed, and much deserved, stage victory. It was a very clever play. Here the stage highlights below. It was funny that the commentators didn’t get Rolland’s decision – they surprised and couldn’t understand why he dropped back.